Traditions are an important part of our holiday celebrations. A sure thing around our home each Christmas are homemade gingerbread houses, almond bark and handmade decorations. When the kids were little, they loved making paper cutouts with glue and glitter. Now that they're older, they'd much rather admire the decorations while munching on Christmas treats. So this year I enlisted Mr DIY to help me! Together we shopped for supplies and then created painted ornaments for the Coca Cola themed Christmas tree that we decorated last week. Each ornament was topped with a glittered monogram, made with our extended family in mind. We live hours apart from family, so when we are lucky enough to spend Thanksgiving together, we always celebrate an early Christmas with a gift exchange. We made an ornament for each person who will be with us, something to take home and hang on their own tree...but I'm getting ahead of myself! 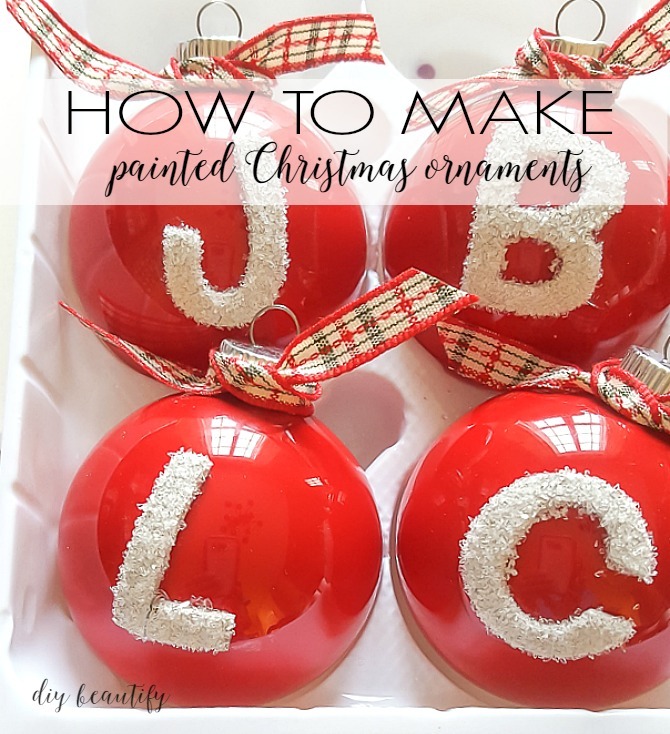 Let me show you how we created the painted ornaments. We picked up a package of 12 medium-sized clear glass ornaments, as well as red and white acrylic paints. Remove the tops from all the ornaments and set aside. Pour a little paint directly into the ornament and tap it against your hand to spread the paint around until it completely covers the inside. It goes quickly, until you get to the lip. Tapping it upside down helps to spread the paint out, but also creates a mess (see below). Once the ornament is covered with paint, wipe the excess paint off the lip, set aside to dry and repeat steps with other ornaments. 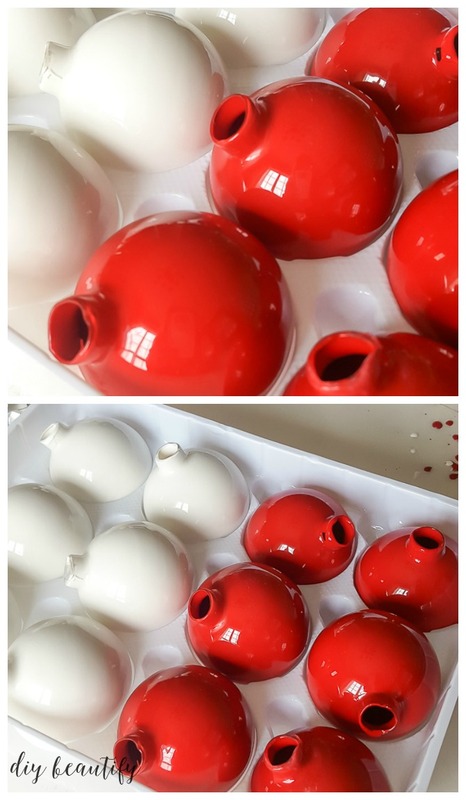 By applying the paint to the inside of the ornaments, you can be assured that the paint will never fade or scratch off. The ornaments will look shiny and be a deep color, no matter what color you choose. 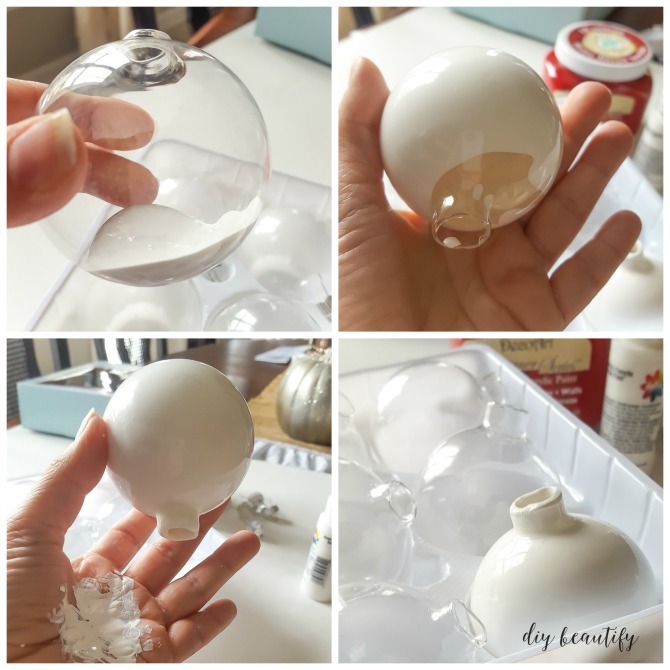 This is such an inexpensive choice for DIY ornaments! You can see that we did half white and half red. I don't think I've ever seen such pretty ornaments at the store! Having a handsome assistant made the job a lot of fun, and it went by much quicker than if I had done it all myself! While the ornaments were drying, we started on the next step, the monograms. We decided to use some foam alphabet stickers that we already had on hand, but they were brown so we had a little work to do to make them pretty. They got a couple coats of white spray paint out in the garage, and while the paint was still wet, we sprinkled on some diamond dust glitter, which is large and chunky and resembles ice crystals. When the letters were dry, a few dabs of E6000 glue made sure they would stay on the ornaments. Because these ornaments were going on my recently decorated Coca Cola Christmas tree, I wanted some of the ornaments to have Coke bottles. I used my Silhouette machine to create a Coke bottle stencil, cutting it out of crafty vinyl. After wrapping the white ornaments well to protect the rest of the ornament, we sprayed them with black paint and then sprinkled on black glitter while the paint was wet. The ornaments were dry and ready to hang in a couple of hours. We tied some gingham ribbon around the tops and clipped them to the tree. Spending time with Mr DIY working on a craft was a lot of fun, even though we made quite a mess. Our hands were covered in paint, glitter and glue. And while clean-up is never my favorite part of a craft project, this year the mess was no problem because we have a brand new Delta Touch2O.xt™ Technology faucet installed in our half bath, which is right off the kitchen, laundry room and garage. It's a convenient place to stop and wash your hands no matter where the mess was made. The faucet is equipped with proximity sensors, which means it's activated any time hands enter a 4" sensing field around the entire faucet! That makes it completely touch-free, which is a blessing when paint is involved. No one wants to have to clean their faucet after cleaning their hands! The Delta faucet means we can embrace the mess and keep the focus on the fun and the memories that we make together! You can see how the whole Coca Cola tree turned out by clicking here. I think everyone (especially grandpa) will be excited to search the tree for their ornament! The folks at Delta invite you to share your messy holiday moments with them too! Just use #HappiMess to tag your holiday traditions on social media. Maybe you'll be featured!